Make It Easy on Yourself / There Goes My Baby / First Love Never Dies / Dancing in the Street / Lonely Winds / Girl I Lost in the Rain / Land of a 1,000 Dances / You're All Around Me / Love Minus Zero-No Limit / I Don't Want to Hear It Anymore / Here Comes the Night / Tell the Truth"
Now better known for whacking slabs of dead meat to achieve a percussive sound, it is often overlooked where Scott Walker came from. With his faux brothers, during the tail-end of the Sixties The Walker Brothers enjoyed a couple of years of absolute teen idol worship in the UK. They scored 3 number one singles and even when Scott went solo with serious music, he could boast four UK top ten solo albums. During the Sixties, it is important to remember the sheer studio talent that was available. They had Ivor Raymonde, a songwriter, Jazz musician, studio professional and father of Simon Raymonde of The Cocteau Twins. Other important Walker Brothers collaborators included Johnny Franz, with a series of production hits throughout the 50s and 60s, he eventually chalked up ten UK number one singles as a producer. We can also mention Nick Venet, an American who brought The Beach Boys to Capitol Records – not a musical person – but just for doing that, utterly legendary. It was this environment in which Scott, John and Gary were encouraged to produce the type and style of recordings they did. This debut LP work by the group features production loosely in the style of Phil Spector with massed strings sitting right on top of each other, played you imagine in a small shoe-box, such is the compression and tightness of the sound. 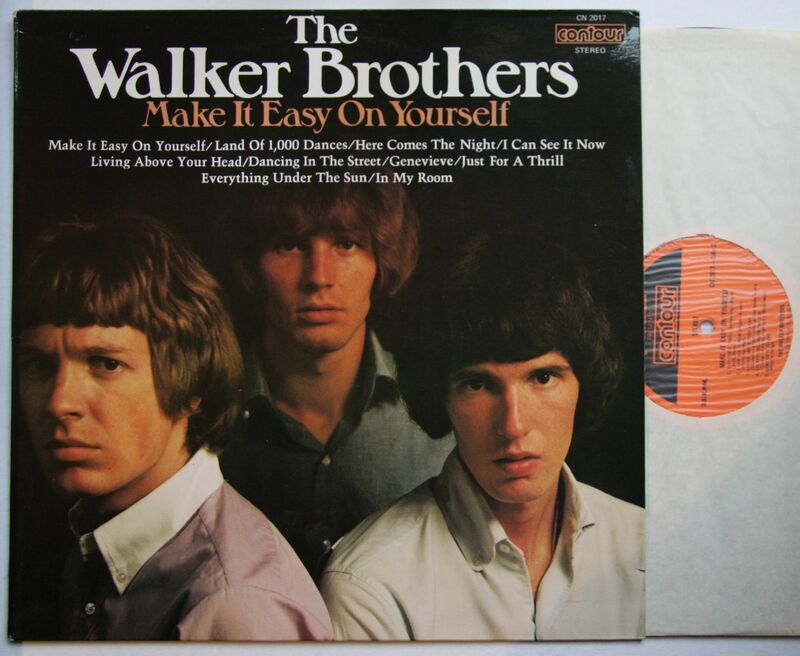 The orchestration is where The Walker Brothers really shine, lead single ‘Make It Easy On Yourself’ features Scott singing lead, with John singing in unison boosting the overall sound and effect. At one point, the strings just drop out leaving Scott singing alone – it’s a very powerful moment. What else? Well, at this stage, The Walker Brothers absolutely were not songwriters of any note whatsoever, hence only 1 song here features a writing credit by any of the band members. Scott co-wrote ‘You’re All Around Me’. The Ben E King and the Drifters song ‘There Goes My Baby’ follows the far better known ‘Make It Easy On Yourself’ on the record, but what’s this? The production is even more kitchen sink, massed backing vocals, booming drums as well as string parts that would sink several battleships. In truth, this track is slightly too much production wise, compare it ‘First Love Never Dies’ where we still get that loud, compressed sound, but marry it with a wonderful Scott Walker vocal absolutely full of emotion. The album loses its way after a strong opening trio of tracks. John sings a couple of dance rock numbers, ‘Lonely Winds’ has no right to exist and is easily as bad as anything on any of the Scott Walker solo records during the mid-seventies. Still such was the life of many a Sixties artist propelled to hit single success when all the record company cared about was selling vinyl, of whatever description. ‘You’re All Around Me’ is ok, even though melodically it is fairly average, that fairly average melody is hugely enriched however with an imaginative string arrangement by those skilled studio guys working at Phillips records at the time, Johnny Franz no doubt had a hand in it. So, we have a Dylan cover too, ‘Love Minus Zero’ which the guys whoever they were behind the studio mixing desk decided needed less of a Spector effect. We still get those great Walker Brothers vocals in unison, not harmony. That’s a big bug bear of mine, singing in unison opposed to singing in harmony are two entirely different things. John and Scott never really sang in harmony – they sang the exact same lines in the exact same key, etc. One Direction to bring this review right up to date, wouldn’t know a harmony vocal if it smacked them on the head and killed them all.